Our Week of Code project to build a physics simulation resulted in us “exceeding customer expectations”, as Mike put it (but we suspect he’s easily pleased!) However, our expectations were really exceeded by the above logo that our designer Gary Ritchie created for us. Unfortunately, we missed the one additional goal that we set ourselves: to produce a short video of the project. Better late than never, here’s a very brief demo that follows the test script. Those of you with a physics interest might be interested to know why energy has decreased as the marble goes around the loop: what we’ve modelled as friction is simulated by collisions of the marble against the tracks. This summer the Wonderland team has been lucky enough to host three interns from schools across the country. As we head into the fall, they are all going back to school, taking their projects and accumulated Wonderland knowledge back with them. Over the next few weeks, we’ll have guest blogs from each intern about how they spent their summer. Hello world, this is Matt Bonner! I’m a PhD student from Georgia Tech’s Human Centered Computing program, working in Blair MacIntyre’s Augmented Environments Lab. This summer, I had the opportunity to work with the Wonderland team as a summer intern. Prior to the team’s week of code (check out the previous blog posts! ), I developed a metadata system for wonderland. The Metadata module allows users and other modules to add pieces of information, or metadata, to cells on the fly. This information is then made available to clients and the server for searches or other queries. In addition to this interface, the Metadata module makes it possible to create general types of metadata to be added to any cell. Completely unrelated cells, developed totally apart from the Metadata module can have the same type of metadata added to them, programatically or by the user in-world. The Metadata module is a great example module, as it uses a wide variety of objects from Wonderland’s toolbox, from cell components to darkstar services to client plugins. It is intended as a backbone or service for other wonderland modules. I’ve developed one such example, the Annotations module, which allows users to attach searchable in-world notes to objects. You can check out the code in the unstable branch of our svn here (Metadata) and here (Annotations). A general overview of the Metadata and Annotations modules, followed by a brief technical description, is below. For some inspiration on how to use the Metadata system beyond Annotations, check out the future work section! A piece of metadata is a collection of fields and values or name-value pairs, such as “author of article” and “matt bonner et. al”. Developers can create different types of metadata, and set which fields are present in that type. Various settings, such as which cells may be tagged with which types of metadata, are also configurable by developers. Users can then tag cells through the cell’s right-click context menu or properties pane with any defined metadata types allowed for that cell, and edit the fields of each piece of metadata. At the moment, developers set whether a field will be user editable or not. Editable fields are by default modifiable by all users. Users may search the server’s metadata, and go-to cells with metadata that matches their search terms. For a general search, users add blank pieces of metadata of whatever type to their search query, and then edit the fields of these target items. The search then looks for cells with at least one piece of metadata to satisfy each term in the query. At the root of the system are the pieces of metadata attached to cells. Each name-value pair is a string to string mapping. A new type of metadata implements the Metadata interface, and then sets what name-value pairs it will store. The base implementation of this interface, BaseMetadata, should serve for most new types of metadata. A java annotation is added to the type to register it with the system, enabling it in places like the general search and cell context menus. This is accomplished with a ScannedClassLoader, a wonderland utility type. 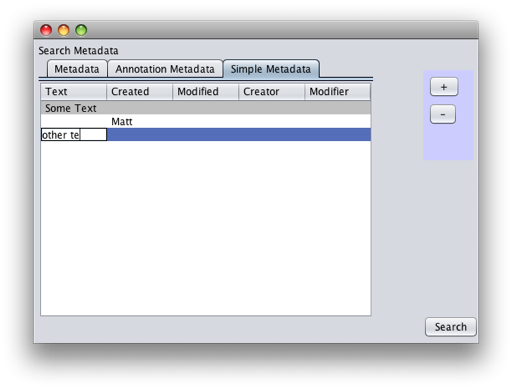 See SimpleMetadata (which extends BaseMetadata) in the Metadata module for an example metadata type. Tags may be added to any cell that has the metadata cell component; MetadataComponent. This may be added by users in the properties pane after the fact, or included by default via a java annotation (see MetadataSampleCell). The MetadataComponent makes a cell’s metadata available to other processes on the client using a caching system to cut down on messages from the server. A corresponding cell component MO is also automatically created to preserve pieces of metadata across server restarts by storing them in the component’s server state, which is automatically saved by Darkstar. The component MO is also responsible for keeping the MetadataService on the server up to date as pieces of metadata are added, removed and edited. The MetadataService is an example Darkstar Service, which provides search access to metadata. The general search’s interface/result component on the client is handled by the MetadataPlugin on the client side. The plugin communicates its search filters to the MetadataService, and receives results in return. The MetadataService is actually a wrapper for a database of metadata implementing the MetadataBackendInterface. My included implementation of this interface uses an embedded ApacheDS LDAP server. If you are curious and a little masochistic, here is a decent introduction to LDAP. This decision replaces the work of creating an extensible search algorithm with the work of translating to and from the backend database’s language. It also makes cross-server searches and distributed metadata backends theoretically possible. An example client of the Metadata module, the Annotations Module creates a new type of metadata which is globally visible to users in-world. Since Annotations are a type of metadata, they benefit from a wealth of ‘free’ functionality: they are searchable and you can teleport to them, they are easily attached to cells, they may be edited from the cell properties pane, they are persisted by the Darkstar server and more! The only thing the Annotations module needs to concern itself with is the client-side display of annotations. There is an interesting side-effect to this. Once the Annotations module is installed (along with the Metadata module), the annotation metadata type is registered with the metadata system: users may add annotations to cells like any other piece of metadata. There will however be no additional visual elements for a cell’s annotations until the AnnotationComponent is added to that cell. The display of all annotations is a per-client setting, adjustable from the client’s View menu. Individual annotations can be cycled between display modes by shift-clicking them. Each annotation has a right-click context menu that allows users to move annotations by dragging them with the mouse, edit using the HUD or delete them all together. Each cell starts with a default color scheme for associated annotations, but the colors can be individually adjusted from each annotation’s HUD editing pane. , for an example of wonderland’s constantly improving HUD system. Finally, there is the in-world graphical component. Annotations are rendered by working directly with the JME renderer that handles wonderland’s graphics. In JME, ‘Nodes’ represent graphical elements in the world. The AnnotationNode extends the JME BillboardNode, an effectively 2D node type that is always facing the user. AnnotationNodes create a JME Quad type, and then using a regular java BufferedImage that is based on the annotation metadata as the Quad’s texture. The textured quad is then attached as a child of the AnnotationNode, which will cause it to appear when an AnnotationNode is attached to another element/node of the Wonderland scene graph. An AnnotationEntity is paired with each AnnotationNode. The entity is an intermediary between the Node and an AnnotationComponent, adjusting the Node’s location and adding/removing it from the root Wonderland scene graph when necessary. The AnnotationEntity is also what makes Annotations ‘pickable’, enabling their context menus and drag-to-move capabilities. The Metadata system is a powerful service, but is only interesting if combined with other projects. That’s where you guys come in! The Annotations module is one example, and I have a few things in mind for our work at Georgia Tech. Here are a few more ideas to get you started. If you have any questions or comments, please post a comment or visit the wonderland forums! A general purpose ‘aggregator’ cell could be created, to gather all cells that fit a certain metadata profile. For example, all cells tagged with the new metadata type ‘Bug’, with the field ‘assigned’ set to ‘Matt’ and ‘Priority’ set to ‘Urgent’ could appear inside my aggregator cell. This creates a new way to collaboratively manage a project. More abstract uses are also possible – perhaps a cell that increases in size or changes color if a large number of ‘Review’ metadata objects with high numbers in their ‘score’ field are attached. This could be used to call attention to favorite exhibits or locations in a Wonderland world. A voting and exhibit system using metadata tags could also be fun – have a science fair, and let users tag exhibits with information (“fossils”, “mount vesuvius”) and ratings. Throughout the fair, users could search for exhibits on certain topics, and see which were gaining the most votes. Metadata objects could be also useful in creating alternative interfaces to Wonderland. The textual, searchable and standard nature of metadata is amenable to a phone interface or an accessible client for visually impaired users. Automated tagging of objects could be undertaken to support this. This could be a very large, very cool project! One idea we didn’t quite get to for our week of code project was the Audio Annotation. The Annotations module could be extended to work with Wonderland’s audio recording classes, enabling users to attach audio clips to their in-world annotations. Users will then effectively be leaving audio-notes in world. This would be especially cool on the timeline, where users could leave their thoughts on each exhibit! There are also various extensions or improvements that could be made to the Metadata module itself. One example I plan to do myself is the ability to add a server-side listener that can watch for the addition of specific types of metadata. This would make creating the ‘aggregator’ cell mentioned above very simple. Another very interesting extension is the ability to tag avatars/users in addition to cells. Imagine attending a virtual conference and tagging people you meet. Your private demo area could be accessible only to people you had given a certain tag. You could search your tags to remember who someone was, or find someone again later. Immersive Education High School – One of our Wonderland community members, Wes Williams, is setting up a new school in the Boston area to allow expelled, incarcerated, or shut-in students to attend high school remotely. Follow the link to view the Roxbury Institute of Technology announcement on YouTube. RezEd Podcast – A Discussion on Project Wonderland – Kevin Roebuck and I, plus Warren Sheaffer from St. Paul College and Matt Schmidt from University of Missouri were interviewed about Wonderland and some of the ways it is being used in education. 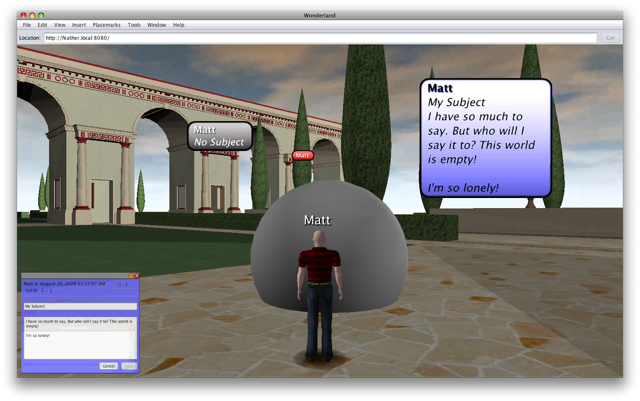 RezEd is an interesting community for educators interested in virtual worlds. Please join the Wonderland discussion on RezEd which Kevin started. I wanted to make people in the Project Wonderland community aware of a Project Darkstar adoption survey we are conducting. This (admittedly non-scientific) survey is an attempt to find out more about who is using Darkstar and for what. The Sun team will consider these results as we update our plans for the future. The survey contains just five multiple choice questions and a couple of open-ended questions for people to tell us whatever they like. All responses will kept confidential within the Sun team and the survey is anonymous. Further details are available in this post on the Darkstar project blog. A direct link to the survey can be found here. We are encouraging anyone using Darkstar to develop a game or other application to fill out this survey. Today was our Week of Code grand finale. By 4pm, both teams had a working demo, which we showcased at the Sun Labs West monthly "Show and Tell" session. Were there bugs? Of course! Did we get everything done we had hoped? Of course not! But there were a lot of smiles at the end of the day. The general consensus was that we met or exceeded our goals of testing out the APIs, filing bugs, creating some useful new sample code, identifying areas that need documentation, and having some fun doing it all. Although both teams did have to fix some bugs in core, neither team needed to make any core changes, so that was a major triumph and the sort of validation of the APIs that we had been hoping for. I want to say thank you to everyone who participated in the week, especially Bernard and Nigel, our two full-time work-from-home team members, who lead the Marble-ous and Timeliner teams. It’s a privilege to work with such a talented group of people. Next week, when we’re less tired, we’ll post some final screen shots and a recap of the event from a technical perspective. In the mean time, please do your part to help stabalize Wonderland v0.5 by helping with testing. Day four finds team Marble-ous boisterously integrating code. Doug implemented really cool shaders for the track and ball, Paul finished the rendering and editing for the track and ball, Deron finished the simulation trace, Jordan and Deron wrapped up multiuser issues, Jordan got the reset button working, and Bernard finished the segment editor. Kevin is still working on the stretch goal of adding sound effects. The day’s goal of having an adequate demo for Friday was met, with revision 922. Team Marble-ous has checked in 7197 lines of code this week, so far. The plan for Friday: fix bugs and polish things up until lunch, then prepare for the demo at 4. Goals: Usable software by the end of the week; reflecting on using Wonderland as a developer and improving the developer experience to make Wonderland the best platform for developing virtual worlds. AT1: Student user uses 3 fixed pieces of track (straight, loop, ramp) to construct the track and then drops a marble on it. AT 1.5: The user is able to remove segments of track. AT 3: After dropping the marble the user is able to see a timeline of the position and velocity of the marble as it traveled down the track and other data than can be derived, including acceleration, potential and kinetic energy, and force. AT 3.5: The user is provided with icons identifying types of track segment. Nigel, the lead Timeliner, explains that the timeline application has a fundamentally different life-cycle than any other Wonderland application we have built in the past. Timelines include three main features: creation, curation, and navigation. The unique thing about creating a new Timeline is that the cell cannot be instantiated until after the user has specified a set of parameters. The unique aspect of curation is that manual placement of objects on a timeline is extremely difficult, so the application needs to assist the user in placing objects. And finally, as was mentioned in a previous blog post, navigating the spiral is a challenge, so the application also has to help users get around. In today’s blog post, I’ll give you an update on what each of the Timeliners has been up to and provide a glimpse of what all the pieces look like put together. Starting on the visual side, Matt has been working on the math and graphics code to generate a spiral. While it’s conceptually easy to take a simple trapezoid and tesselate it around a core to create a spiral, it’s been a little tricky to accomplish this in Wonderland. Every single point on every trapezoid has to be individually calculated and there was a learning curve to figure out how use quaternions – representations of rotations. In addition, the JME quad meshes didn’t work properly, so after a lot of hair pulling and double-checking the math, Doug suggested that Matt try using tri meshes instead, and finally the timelines started rendering as expected as you can see from the image above of our first automatically generated timeline. Drew is implementing a cool slider on the HUD for navigating the spiral. As you move the slider up and down, your avatar zips around the spiral. The HUD panel also shows your current position in the form of a date. Nigel is building and hooking up what seems like a million dialog boxes. There’s the main dialog for creating the timeline. This one collects the basic information about the start and end date of the timeline, the desired units of time (hour, day, week, month, year), and the size of each unit. We spent quite a bit of time deciding how best to express the size of the units. For example, if you set up a timeline by day, do you want one day to take up a 10th of a turn of the spiral, or do you want it to take up 2 full turns. This will depend on how much data you want to display for each day. We finally decided on expressing this in terms of revolutions. So you can set the scale of the timeline to make one revolution equal to values such as 1 hour, .5 days, 2 weeks, 3 months, or 100 years. You can also specify a variety of other parameters that govern the look of the timeline. Other dialogs include one for manually entering text, images, audio, or 3D models, one for setting up "keyword collections," and one for adding "timeline providers." Jon is working on these last two features. He has written a timeline provider API that is an extensible mechanism for adding dynamic data to a timeline. Each provider is specialized for a certain type of content. Examples of providers might be news, wikipedia events, Time magazine covers, NPR podcasts, personal calendar information, a twitter feed, stock quotes, or any other information source that is time-ordered. Each provider decides what input it needs from the user. For example, a news provider, which might aggregate news from a variety of sources, might take a user query and ask the user to make some decisions about which news sources to search. Since images are easy to render in Wonderland, Jon tackled a Flickr provider first. In its simplest form, this provider takes a query and uses the "date taken" field to decide where on the timeline to place the resulting images. The default is to display one image per time slice. In the advanced configuration panel, users can specify the number of hits per time slice to display, whether to search the full text or just the tags, whether to select the images based on relevance or interestingness (that’s a Flickr term), and whether to use just Creative Commons licensed photos. Drew is responsible for figuring out how to lay out the results of each provider. He is taking a two-step approach to creating a timeline layout manager. The first step is finding the correct cell type to display the data from each provider. For example, if the provider returns images, we use the image viewer cell and if it returns text, we use the sticky note cell – a new feature conveniently contributed to unstable modules by a community member just yesterday! The next step is to put each object into the appropriate time slice and figure out where in that time slice it should go relative to other objects. To the right is a video of the first timeline generated with Drew’s layout manager. These queries will be handed to each timeline provider configured for the timeline. For example, if I have a Flickr provider, a Wikipedia provider, and a Google 3D warehouse provider, the same queries will be sent to all three services and I’ll end up with a photo of Fallingwater, the Wikipedia article about Fallingwater, and a 3D model of Fallingwater placed on the timeline at 1934. Of course, we won’t be able to build all these providers by Friday, but hopefully we’ll have a Flickr provider and a New York Times news archive provider automatically laying out the data on a dynamically generated timeline. Others can then extend the functionality by writing new providers. t bleed above or below the segment, or people will hear it in the wrong place. At first this problem seemed daunting, but Drew came up with a service to send notifications when an avatar transitions from one time segment to another, which dramatically simplified the audio calculations. Another challenge is nicely blending the audio so that it doesn’t sound jarring as you navigate from one segment to the next. Just to explain why we’ve been so heads-down, the Timeliners have written 12,333 lines of Java code in 4 days! You are currently browsing the Wonderblog blog archives for August, 2009.